The Finnish programme for Nordic cooperation aims to secure welfare by extending cooperation between different government departments and organisations. But can it be done? Iceland’s Welfare Watch is one of the best examples of an innovative way to cooperate. The Nordic Labour Journal has previously written about how the Welfare Watch came to be and the role it played during the economic crisis which hit Iceland harder than other countries in 2008. A group of 35 people were tasked to warn authorities if various social groups were falling outside of the welfare system, and to come up with ideas for what could be done to prevent it from happening. 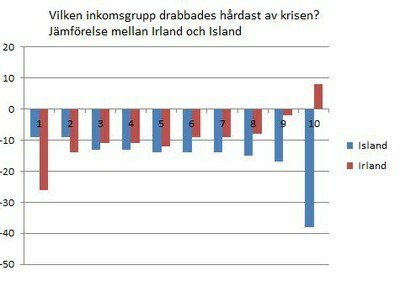 Iceland is often compared to Ireland in research on the finance crisis. The Welfare Watch also created waves in the Nordic region. It led the Nordic Council of Ministers to launch a three year long research project, which will conclude on 10 November this year with a conference in Iceland. The results form the research on the crisis management strategies are presented on a dedicated webpage, welfarecrisis. It allows the reader to compare how different countries like Ireland and Iceland handled the crisis and shows that the Icelanders weren’t blowing hot air when they said they were protecting the weakest in society. If you look at the development in disposable income in the two countries during the year of the crisis, 2008, and then look at ten different income brackets where 1 represents the lowest income and 10 the highest, the differences are striking. In Ireland, people in the bottom income bracket lost 26 percent of their income, while the corresponding group in Iceland only lost nine percent. People in the highest income bracket in Ireland saw their income rise by eight percent, while the richest in Iceland lost 38 percent of their income.